Go to this site (http://www.tackfilm.se/) and upload a picture of yourself. Then come back and read further! I encountered this site via Hanna Wyrman’s updates on Facebook on Friday. 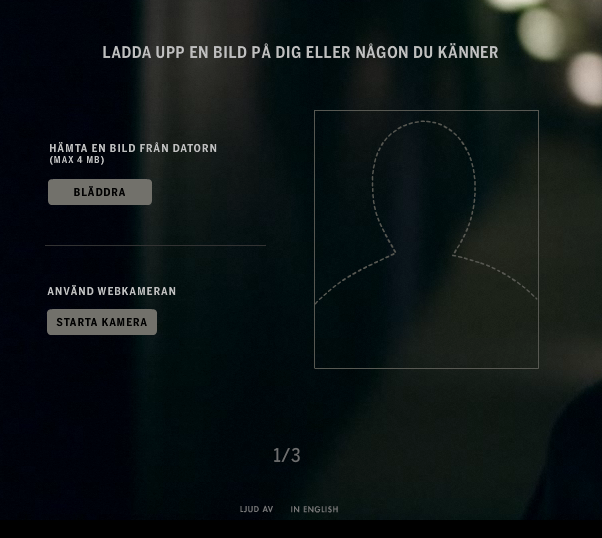 She kindly informed me that this was an ad to encourage Swedish residents to pay for their license and support public television (I’m assuming that it is the same system as the UK/BBC). Here’s what happens: after uploading a photo (I think the point is to upload your own, playing the vanity card here), a film starts. Its esthetic is that of a highly edited news report, with high production values. The stage is set for a press conference, interspered with multiple shots of people getting together around various media, tuning in to the news in different ways. An identity is going to be revealed, and, quite predictably, the main speaker at the press conference pulls out a photo out of an enveloppe and, voila, there is your picture! YOU are this mystery person. But then the fun starts, as the ‘reporting’ continutes. And the ‘hero’ is celebrated in the range of settings foreshadowed in the first part of the film. And, the fun part, the photo continues to travel and shows up across a wide variety of settings, from public to intimate, from institutional to counter-cultural, from commercial to private. In the process, it’s hard not to get at least a bit caught up in the iconization of the image that is going on. Of course, this is a highly artificial pastiche of how images circulate and are valued. But this little interactive media production does capture something that I think is crucial to contemporary visual culture: the effect of the combination of circulation and reinscription of images in different settings, and a combination of digital and optical approaches to photography, which amounts to ‘network realism’.